South African Andrew Murray wrote over 240 books, many of which have been reprinted by Bottom of the Hill Publishing. The three manuscripts inside this book, deal in one way or another, with our Lord Jesus Christ. 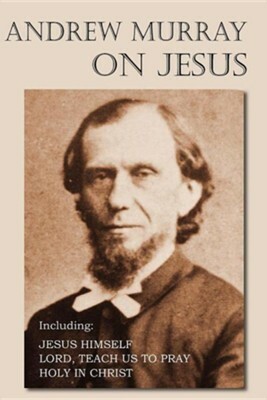 Thus the title, Andrew Murray on Jesus. The first book, Jesus Himself, asks the question... "Is it possible to have Jesus Himself, but not to really know him?" It is obvious that Murray has given this topic much thought and consideration, and you will enjoy reading his answer to that question. The second book, Lord, Teach Us To Pray, has the Lord Jesus saying that "The hour is coming, and now is:," explaining that only in Him and through Him will the worship of God be in Spirit and Truth. Serious Christian scholars will find Murray's conclusions both thought provoking and deeply meaningful. The third book, Holy in Christ, represents thoughts on the calling of God's children to be Holy as He is Holy. All through this book, author Murray uses the words of the Lord Jesus Christ to explain the concept that only through Jesus can we find God and become Holy as God desires us to be Holy. Serious reading will help you to understand and accept God's wonderful message and gift. At the conclusion of these three books, few Christians will ever look upon their walk with Jesus Christ in the same way again. I'm the author/artist and I want to review Andrew Murray on Jesus.